Magazine article reading online is growing in popularity. According to Marketing Analytics, authoritative research firms (Nielsen and Mediamark Research Inc.) found that an average of 83 percent of visitors to the Web sites of 23 large-circulation monthly magazines access those magazines’ content solely online. That may be true, but some things are lost in the online posting. One is a new gimic from the current issue of Newsweek magazine. Häagen-Dazs is running an ad embedded with flower seeds that can sprout as the linen-based paper decomposes, according to a brief in the Merced Sun-Star. The connection? The ad is part of a company effort to combat colony collaspe disorder of bees. 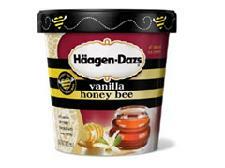 As reported in this blog in February, the ice cream maker provided $250,000 for colony collaspe disorder research to UC Davis and Pennsylvania State University, and started a "Häagen-Dazs Loves Honey Bees” Web site at www.helpthehoneybees.com. Now Newsweek readers can tear the Häagen-Dazs ad from the magazine and plant it in their backyards to grow wildflowers that make nectar for bees. But the online readers are out of luck.